See I really am very proud. When I fell two weeks ago I went into denial. I returned a cane that was lent to me within two days and absolutely refused to even consider buying another. I put on such a good suffering act for everyone and did not take ANYONE'S advice. I was just fine I kept telling them. Then one day I limped into Target and noticed those red handicapped shopping cart. It had been over a week of pain and no one was looking that day. I qualified for one of those I told myself and I sat down. Still, I was not sure if I was ready to do the cart thing so it didn't happen without a fight..."the cart will not go" I said sounding like a spoiled child. I stood up wincing as I put weight on that wounded knee. I was such a good sufferer. My husband reached over and unplugged the cart giving me that look because then it ran just fine. As I drove off toward the curtains I had set out to buy, I realized what a wonderful thing those red carts are. They can turn on a dime and have a big basket so I can buy lots of stuff. And the view...really there is a whole other world visible when you are sitting down. The only problem I had was avoiding running over children when I turned a corner. My husband walked ahead to make sure it was all clear. HUMMMM I thought, I may just be onto something. And did you know that, when you are wounded, people are really nice to you? Seriously, they open doors, let you get in line early and generally are concerned about how you are doing. Who knew? I am surprised that people don't take advantage of this situation! Maybe they do. I am much better now. Wonder of wonders, I bought a cane and some support hose yesterday! They are both great and I am a very lucky woman today. We leave for a month long trip that will take us to Florence, Italy and then to Dubai. Wish me luck...but I don't really think I'll need it. Stay tuned for the further adventures of b+. Hopefully, I won't need any chairs with wheels but if I do, I will do it with grace and style. After all that is what I am all about...that and cussing! Note: I would like to add a disclaimer here...while being in that much pain was not good I think this experience has given me a different feeling about coming to the place when I might need some help later permanently. I think it will only be what I make of it. I realize now how hard it is for older people to give into their disabilities. I am sure that, like me, they think they will be "just fine". I also drew hope from seeing what others have accomplished with rehab. It kept me going when I began to think that I may be unable to function later. 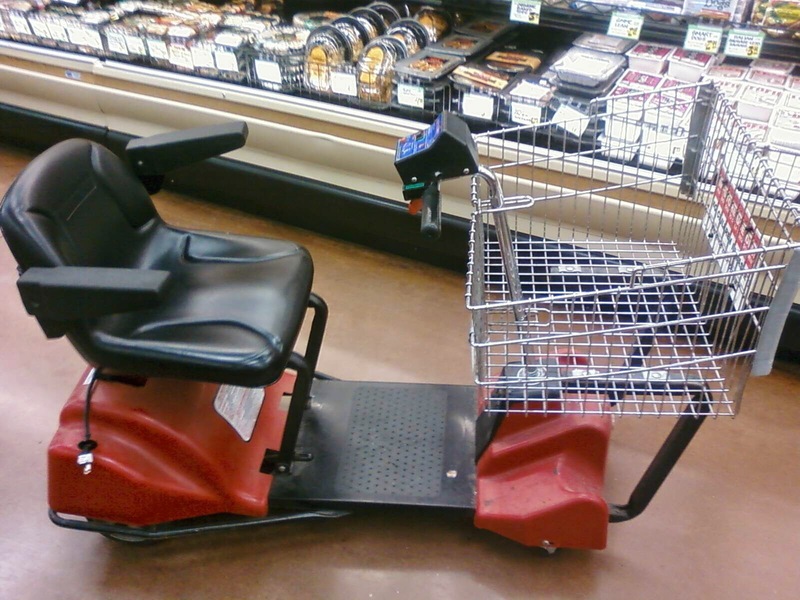 Barbara, I think it's great that stores furnish these carts and I always give them right-of-way. Just wish the aisles were wider. Glad to hear you're back on your feet. Pack your cane. Mine was crucial in Paris 10 years ago when I'd hurt my SI joint. I've always wondered about people's reluctance to use mobility aids. I can see that they are a double edged sword but when they facilitate mobility, wouldn't it be better to use them than not? I'd rather be mobile with one than immobile without one. I'm learning from my friend who has MS. She feels like the brace, the walker, the w/c - they all just attract unwanted attention to her. However, she never weakens. She even painted her walker red!